Aiming to put a charitable spin on a music event, Underneath introduced real-time fundraising into a live gig environment. 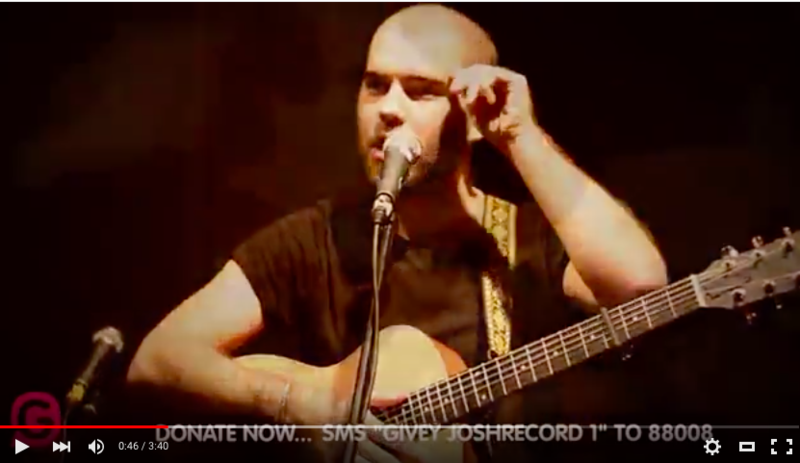 Taking place at Floripa in Shoreditch, the event included musicians Josh Record and James Craise who both put on fantastic peformances for the packed out venue and raised money for their favourite charity at the same time! Both artists had their own Givey Tags (your unique fundraising shortcode used on Givey), and had the opportunity to share a bit about the charity they had selected. Throughout the night the audience was encouraged to make donations if they enjoyed the music and wanted to contribute to the artists charity. Donations were displayed on the large screen in real-time on the Givey feed, and could be made via SMS and Twitter. In order to make things more interesting, a prize was up for grabs for whoever donated the most to each artist during the event. At the end of the night the winners were able to select someone in the audience, including themselves, to be serenaded with a song by the artists on stage! This resulted in lots of laughs and last-minute giving, for those who were desperate to embarrass one of their mates with a live serenade! The event was really successful at engaging a new audience with giving to charity, and allowed the audience to have a good time and know that their contribution towards the artists was going to a good cause. We have learned that using a Live Feed on a big screen and introducing a competitive element to fundraising events is a fantastic way to engage donors, raise more money, and create stronger memories of the event. Please contact support@givey.com if you are interested in making your next event more engaging and rewarding for your audience – we would love to hear from you.